Introducing the next generation of exercise electrocardiography by SCHILLER: the CS-200 Touch with touch screen, 12/16 channels and unique BP monitoring technique for stress test. Due to its well-accepted, easy operation in all modes, CS-200 Touch is ideal for the office and for clinical applications. Integrated database connectivity to the office computer and clinical information systems allows electronic data retrieval and a paperless environment. Schiller introduces the next generation of exercise electrocardiography – CARDIOVIT CS-200 Touch. Being an internationally leading manufacturer of medical equipments and technology, Schiller AG has always made it a point to provide sustainable value and improve the products continuously. Committed to the highest possible quality standards and perfection, Schiller medical devices are known for their ground breaking technology and peak performances. Having an extensive experience in the domain of ECG, Schiller has developed a leading-edge exercise electrocardiography system named Cardiovit CS-200 Touch that combines precision, precision and sophisticated ergonomics. This device can perform multiple clinical tests including 12/16 channel resting and exercise ECG, Holter ECG and 24h Ambulatory Blood pressure monitory (ABPM). CS -200 Touch is a multifunctional and PC based system designed to enhance productivity and streamline exercise ECG testing. Stress testing is carried out in order to get a detailed understanding about the functioning of heart’s electrical conduction system. ECG taken during the test and the rest assists the physician to detect coronary artery disease, assess the heart rhythm, and evaluate the heart rate and blood pressure. Modern ergonomic design of this cardiac assessment system comes with a height-adjustable transport cart. Compact size and easy-glide wheels of the CS-200 Touch render effortless maneuverability, making it an ideal system for the smallest and most crowded spaces of hospital. The medical grade panel with antibacterial plastic housing ensure hygiene and quality results. With the wireless keyboard of CS-200 Touch, data entry task is breeze. Built with the latest technology specifications, Schiller CS-200 Touch Exercise stress test system provides accurate and complete reports. High-frequency QRS signals and vector 3D ECG, four methods (Bazett, Fridericia, Framingham, Hodges) to correct the QT interval for heart rate and signal averaged ECG analysis paves the way to ground-breaking diagnostic capabilities. Comprehensive ETM™ algorithm for ECG interpretation further assists the physician in taking informed therapeutic decisions thereby cutting down the unnecessary medical expenses. 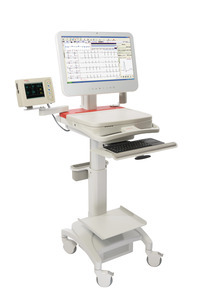 Moreover, the Schiller ECG machine can operate as a stand-alone unit or in a networked environment.